Ian G. Barbour is a physicist, theologian, author, and winner of the 1999 Templeton Prize for Progress in Religion. He is also the Winifred and Atherton Bean Professor Emeritus of Science, Technology and Society at Carleton College in Northfield, Minnesota. As a well-known pioneer in the growing field of Science and Religion, Dr. Barbour established his reputation as an interdisciplinary scholar by way of his influential book, Issues In Science And Religion, first published in 1965. Since that time he has authored many additional books and articles. For example, his book Myths, Models And Paradigms has served as a useful tool for those persons who wish to study the methodologies and approaches of scientists and scholars of religion. 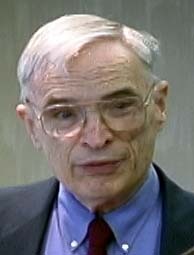 As a follow-up to delivering his Gifford Lectures (1989-91), Dr. Barbour also published Religion In An Age Of Science and Ethics In An Age Of Technology. In recent years, his book entitled Religion And Science: Historical And Contemporary Issues has often been used as a course textbook. Dr. Barbour's latest book, When Science Meets Religion: Enemies, Strangers Or Partners?, is now available in local area bookstores.